A New Captain On My Ship! I’m going to be really open today with raw emotions on this post. It’s like I’ve been sailing on a ship that has just been floating with anchor down. The anchor can be defined as my procrastination and feelings of unworthiness. That anchor was being held down by the devil. 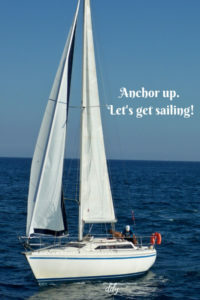 It’s time to pull the anchor and get sailin’! I feel God is calling me to step out in faith and quit being so timid. He called me to do a job and when I don’t do it, I’m sinning. You see this last year I have let the devil talk me down from doing what the Lord has called me to do. I am called to be a writer, a speaker and a teacher. I love organization and decorating. I love making a difference to others and doing acts of kindness. I love sharing Jesus with people. I love helping people be all that God created them to be and helping people make their goals and dreams come true. God has blessed me with the spiritual gift of serving and encouragement. I’m tired of not doing what I know I should be doing. I’m ashamed of being such a procrastinator and having such a feeling of low self-worth. The devil knows he was winning by distracting me from what I know God wants me to do. But I’m done floating. Today and in 2019 I am going to do some things that are out of the box for me and move forward in what I know I should be doing. I’m going to let God guide my path and take leaps of faith. I’m throwing the devil overboard and hoping he sinks. I’m ready for my journey with the One and only Captain leading my ship. 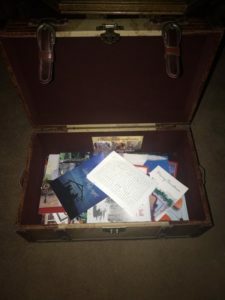 If you feel like you or your civic organization, school, women’s group or church needs someone to encourage them with ideas for organization, decluttering, personal goals, finding out how to be all God created them to be or how to show more kindness in this world, then I would love to share with you all the ideas in my treasure box. No destiny is too far and no challenge too big with God on my side. I’m ready to sail! You can find out more on my speaker page. I appreciate your prayers and passing the word along as I embark on this journey in possible unchartered waters. This entry was posted in devotional, inspirational, motivational, spiritual on December 31, 2018 by Deanna Young. Christmas cards so merry and bright. Christmas cards a beautiful sight. Some with pictures from family and friends. Some with letters telling us where all they’ve been. All with good wishes for a holiday so grand. And for those who didn’t get cards sent, a yearly hope to give it a try again! With a promise to start earlier to send mine out next year. And to those who will be spending Christmas without loved ones this day. We display these cards for all to see. Along the mantel, in the doorway, under the tree. What do we do with these cards that were on display? I read an idea, one I’m going to try. You place the cards in a basket and keep close to the eye. A card you select, one a day. And for that person or family, it’s your day to pray. It will be fun to see God’s blessings unfold. And humble to have the honor to pray as we are told. I’m anxious to hear what you do with your cards. Maybe this idea I am recycling will give you a start. As we remember the Christmas that is now in the past. May your New Year bring lots of blessings and daily prayer rituals that will last. This entry was posted in devotional, inspirational, motivational, spiritual on December 28, 2018 by Deanna Young. What was Mary thinking as she walked the long dirt road to a town miles away from her home and her own mother, not knowing when this baby she was carrying would be born? Can you imagine her fear? Her uncertainty? I’m sure she was fearful of what people would say. She probably didn’t know what to think of all the pains and weird feelings of labor. I imagine she cried and dripped with sweat as she groaned through birthing pains. She had to be uncomfortable as she probably stepped in cow dung and laid on itchy straw with slobbery animals staring at her while she tried not to breathe in the smells of the barn too deeply. And I’m sure she was scared. Scared to death. But after the birth, I wonder what Mary was thinking. I bet she realized how blessed she was. She had a warm, dry place to have a baby. She had her sweet Joseph to comfort her. She got to be the mother of the Messiah prophesied for years. And she had the favor of the Lord. She had to be thinking how awesome this was. Yes a big responsibility. But it was so stinkin’ cool that she got to be the Mother of Jesus!!! As we hustle around wrapping gifts, decorating our homes and preparing our oversized meals, may we stop for just a few minutes to remember the reason we celebrate Christmas and give gifts. God gave His gift to the whole world. One gift. On a symbolic Christmas Eve night. Mary focused on that one gift that first Christmas. Her baby. Emmanuel, Wonderful Counselor, Mighty God, Everlasting Father, Prince of Peace. 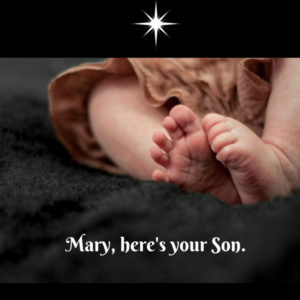 May we also focus on this one gift as we remember Jesus on our own memorable Christmas Eve. This entry was posted in devotional, inspirational, motivational, spiritual on December 24, 2018 by Deanna Young. He took pride in his kids and his grandkids. He took pride in his Korean War service. He took pride in his many years of hard labor working on the farm and in his early days, delivering milk. He was the #1 Jac-Cen-Del Eagle fan for his life. He went decades without missing a basketball game. He was proud to cheer for his son, his granddaughters, his grandson-in-law on the court and be a support for his daughter and granddaughter as they led the crowd in their JCD cheerleading uniforms. He had a gentle touch with his great grandsons and laughed with his granddaughters. One cooked for him. One took him to McDonalds. And one squeezed his cheeks. Whether he was bossing people around on the farm, in the garden, in the vehicle or in the house, we let him think he ruled the place. He was a great story teller and had a mind sharp as a tack. He never wore reading glasses although those yellow safety glasses made many appearances. 🙂 And we all know the hearing was gone long ago! Dawned in his plaid shirt, jeans and a sweater, he made his way to church every Sunday that it wasn’t bad weather or he wasn’t on vacation. The back row, right corner was reserved for him. He loved food especially Rita Gookins’s cooking and a good fish sandwich and nuggets from McDonalds. He loved butterscotch pie and never passed up a box of candy. 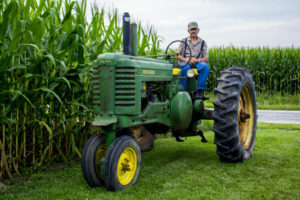 He tooled around on that golf cart with his oxygen tank handling the affairs of the farm (to the best of his ability). I’ve seen referees laugh at him, joke with him and throw him out of games. haha I’ve seen coaches look for him when he wasn’t sitting as the bookend on the visiting bench. I’ve heard many fond memories and laughter shared when checking on him over the last several years as his health began to fail. 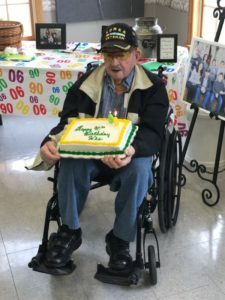 But he wanted one thing and that was a 90th birthday party and we did it up right! We know he will celebrate 91 in heaven but we will be celebrating his life right here on earth. Remembering hog shows, squeezed cheeks, shaking fists, tissues under his shirt, large-knuckled-hard-working hands, tractors, cattle, cats, gardens and grain bins. Laughter with his hand on his forehead, grandkids on his lap and Korean war hat on his head. He lived a full life and brought fullness of life to our family. Syalvester, with an A (a mystery we never understood), you will be missed. We love you. This entry was posted in Uncategorized on December 17, 2018 by Deanna Young.